1. Heat the tawa in a medium flame and grease it with oil. 2. 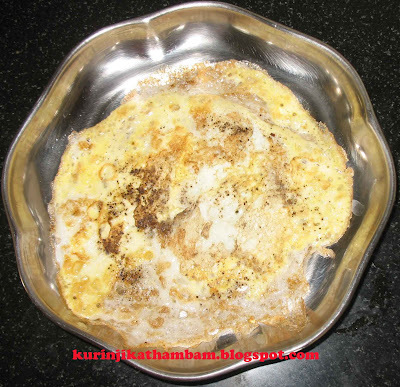 Crack the egg open and pour the entire yoke on the tawa. 3. Sprinkle pepper powder and salt over the yoke. 4. After it has been cook turn over the yoke to other side. 5. Remove after both sides on golden colour. It goes well with sambar and rasam rice. Yes we love omelets, and yours sound perfect!